The Howard Leight Genesis Series glasses feature wrap-around lenses for uncompromised peripheral vision and protection. Adjustable temple length and lens inclination for a custom fit. Features MMT (Multi-Material Technology®) on the brow and nosepiece for comfort and impact diffusion. 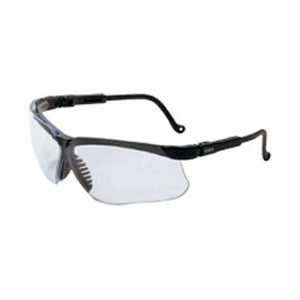 Unique ventilation channel between the frame and lens delivers superior fog control. Made in U.S.A. Exceeds ANSI Z87+ high impact standard. Meets U.S. Military V0 ballistic test for impact.